Generally speaking, most of the free-ranging birds here are dual-purpose breeds with docile natures. Dual-purpose is a term used for poultry breeds that are considered good egg layers and also are well muscled for good eating. Most of these breeds lay varying degrees of brown eggs. 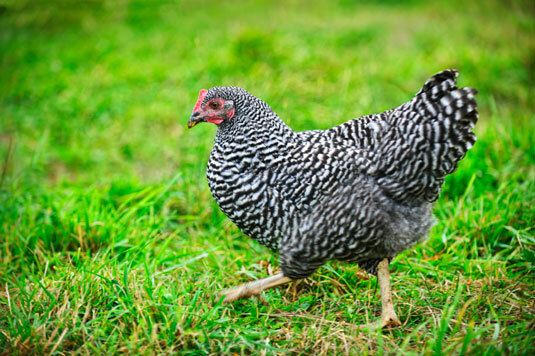 Avoid chicken breeds that are white-feathered for free-ranging in gardens. White-feathered chickens are much more visible to predators. 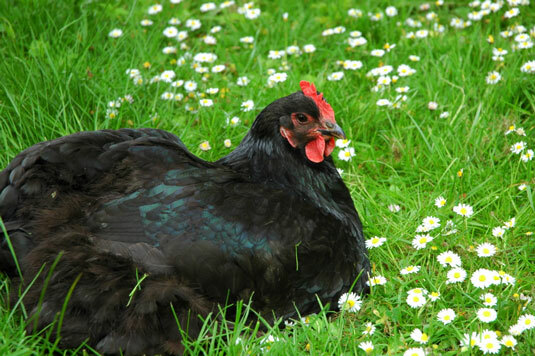 Darker brown, black, and honey-colored chickens blend in better in a garden. Buff Orpingtons: The Buff Orpington breed could be the Labrador dog of the chicken world. They’re docile, people-friendly, and good foragers. 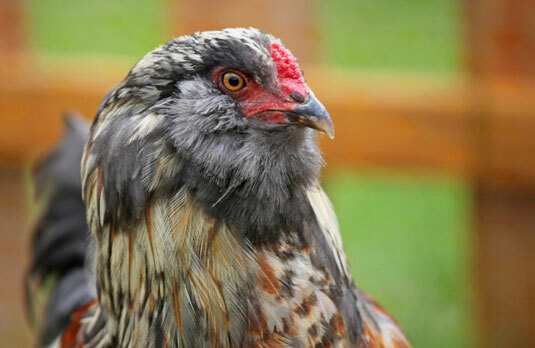 Cochins: Cochins are a favorite with the children because they’re showy and have feathered legs. They’re also good foragers. Houdans: Houdans have a docile nature with an extra bonus of wild-like ornamental feathers and an aggressive foraging ability. Polish: The Polish breeds are beautiful and usually comical with that mop of feathers on their heads. Sometimes they’re at a real disadvantage in the garden, simply because they can’t see very well with that headdress. Give them a trim to help them see well. 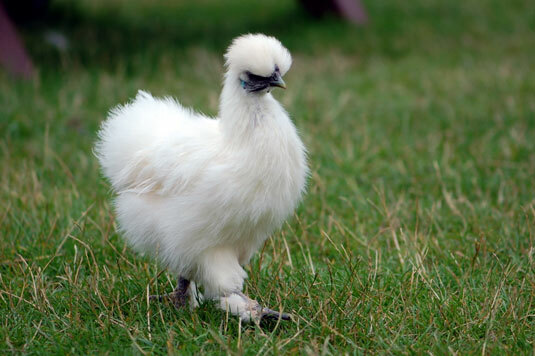 Silkies: Silkies are very docile chickens that make good pets. They’re reminiscent of Persian cats. They’re quite different in appearance from other chickens, with their fluffy plumage, dark blue flesh and bones, and five toes on each foot (all other chickens have four toes on each foot). They can be a good free-ranging breed for a garden if you can keep them dry and out of inclement weather. If you live in the desert or a place where summer temperatures are above 90 degrees Fahrenheit for weeks at a time, you must take extra measures to keep your chicken flock cool. Make sure you have more than one source of water for your chickens. If they’re able to roam freely in your garden, your chickens will probably try to bury themselves in cool soil under a large, shaded shrub. If they’re in a chicken coop in high temperatures, provide plenty of water and fresh-air circulation — either natural or with fans. An automatic misting fogger system is also a good solution for extreme heat. Chickens in heat distress pant and lift their wings away from their bodies. In high temperatures, chickens stop eating and laying eggs too. If you want chicken breeds that give you a variety of egg colors, like a basket of Easter eggs every day, choose breeds that give you a variety of colors. Most eggshell colors fall under some variation of white, brown, or blue-green, specific to each chicken breed. Even with the amazing number of chicken breeds today, nearly three dozen chicken breeds are in danger of extinction. 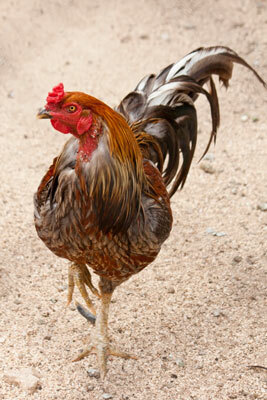 Heritage chicken breeds, also called heirloom chicken breeds, are breeds in danger. These breeds tend to be larger birds that are slower to mature, yet they’re productive longer in life. They originate from purebred genetic lines that existed prior to 1940. 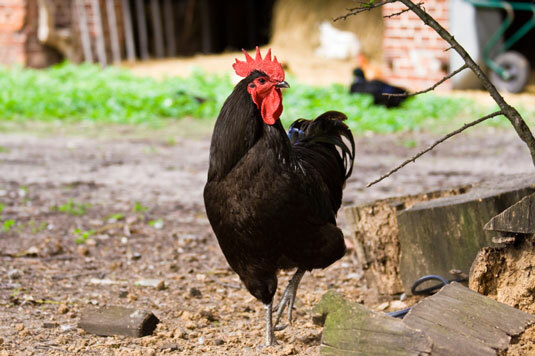 Heritage chickens are good foragers and do well in free-range and pasturing environments. With the industrialization of chickens in the mid-20th century, many of these heirloom breeds were deemed less desirable.